The following story was published in the magazine "Selides" (vol. 93) from September of 1993. The original title was "The Miracle of the Invisible Nun". In the midst of the village Mathiatis and Sia in Nicosia in a beautiful, green forest is a small church. It is the only one in Cyprus dedicated to Saint Irene Chrysovalantou. Behind this church is the story of Mrs. Anastasia Homer from Mathiati. This woman believed in Saint Irene Chrysovalantou and built, together with her husband, a very pretty church which began services these days with permission from the Archbishop. Anastasia Homer was married for 25 years and was unable to have a child. Day and night she prayed to the Virgin Mary to send her a child. She reached a difficult age to be able to have her first child, but she did not give up and continued to pray. "My wish is for everyone to know of the existence of this church so that people will come here to visit it and to pray to Saint Irene Chrysovalantou, who is so miraculous for whatever they wish. I decided to build this church spending money with the help of my husband, who built it together with some workmen. I was disillusioned by praying night and day to have a child. I did not want riches, but I very much wanted a child, especially a little girl. I then cried and told my friend about my problem. She recommended the following. 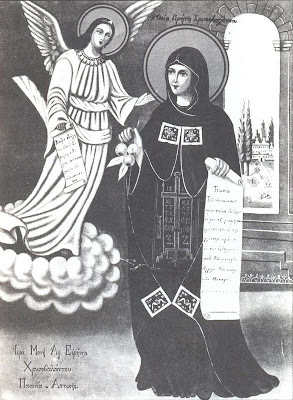 Pray to Saint Irene Chrysovalantou and whatever you ask for she will give you. We then prayed together, and after about 20 days I was pregnant. Thus, since I was indebted to Saint Irene, and as I read in the newspapers that there is no church here and the people celebrate her in Saint Trupioti in Nicosia, I thought that I must build a church for Miraculous Saint Irene. That is what happened. As soon as I had my little girl after 25 whole years of marriage, and I named her Irene Chrysovalantou, we began to build the church for Saint Irene. After the church was finished my husband was killed in an accident at the brickyard where he worked. In the same way that I accepted the birth of my child, so also I accepted the pain of my husband's death. My hope, my joy and my relief is for this church to be known by everyone, because that is my mission today, to make it known that here in Mathiati there is a church for Saint Irene Chrysovalantou, and for worshipers to come and pray to her."